The Hudson Valley Renegades fell to the Brooklyn Cyclones 8-3 on Wednesday night at MCU Park. The Renegades struck first in the third inning. Kyle Holloway and Diogenes Luis delivered singles to put runners on the bases for the Renegades. Derek Dietrich then plated the run with a single to score Holloway. Luis would then score on an RBI single by Steve Tinoco to take a 2-0 lead. But Brooklyn would match the runs and raise it by two with a four run home half of the inning. Taylor Freeman drew a walk followed by a single to Luis Nieves. Darrell Ceciliani then tripled to center, driving home both runners. Ceciliani then scored on a ground ball by Cory Vaughn. Jeff Flagg ended the scoring rally with a solo home run to give them a 4-2 lead. Brooklyn pushed across another run in the fifth inning. Cody Holliday doubled to right then scored on a sac fly by Flagg to increase the lead to 5-2. 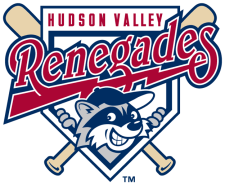 The Renegades scored their final run of the ball game in the sixth inning. Nicholas Schwaner singled to short then advanced to third on a double by Burt Reynolds. Craige Lyerly picked up the RBI with a ground out that scored Schwaner and pulled them to within 2 runs of the lead. Brooklyn got another run in the seventh. Vaughn tripled to right then scored on a wild pitch to increase their lead to 6-3. Then a two run homer by Nieves in bottom of the eighth put the game out of reach and ensured the 8-3 win by Brooklyn. Wilmer Almonte suffered the loss, allowing 5 runs on 7 hits with 2 strikeouts and 2 walks in 5 innings. Hunter Hill allowed a run on 3 hits with a strikeout in 2 innings. Robert Dickmann pitched the final frame, allowing 2 runs on 2 hits. The Renegades (5-7) return home to Dutchess Stadium to begin a three game series against the Aberdeen Iron Birds (5-8).